The Bradley County Road Department needed to replace an existing concrete box culvert on a main road in Cleveland, Tennessee. The bridge replacement needed to be completed quickly to alleviate the traffic concerns of county residents. 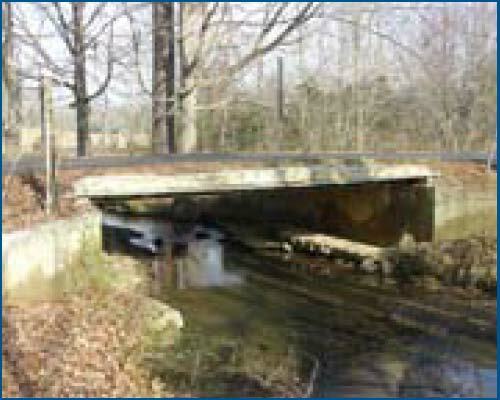 Bradley County engineers selected a Contech Aluminum Box Culvert to replace the old structure. The Aluminum Box Culvert allowed the county construction crew to form and pour the concrete footings, erect the culvert and install the structure themselves, including the Aluminum Structural Plate headwalls and wingwalls. Choosing this type of structure allowed the Road Department to budget money, time and resources efficiently. Additionally, the lightweight culverts require minimal maintenance and the design and installation of the structures are covered by AASHTO Standard Specifications for Highway Bridges. “Contech’s Aluminum Box Culverts are a fast and efficient solution for our deficient bridges” said Tom Collins, Bradley County Road Superintendent. “The culverts also make it easier to widen the road in the future” added Garry Murray, Bradley County Assistant Superintendent. Over the past six years, Bradley County has installed more than 17 Contech Aluminum Box Culverts to replace deteriorating bridges throughout the county.